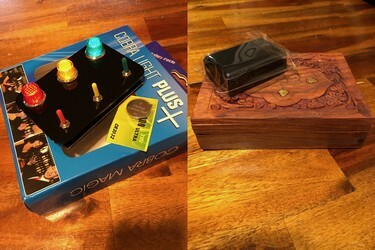 Description / Ad Copy: This Cobra Light is a new version of the old switch box in a new & exciting way, small and wonderful and fits in your pocket with a new feature that will have everyone in shock. This trick can be played and operated by your volunteer to maximize the effect - let them switch the lights on and watch their mouth drop. EFFECT: The magician introduces a small handheld electronic device consisting of three colored lights (green, yellow, and red) and three matching colored switches below each light. The magician begins by demonstrating that each colored light is activated by the corresponding colored switch directly below it. The light switches are turned off and all three colored switch covers are removed. The spectator chooses a different switch to put the green cover on (no force). The switch is turned on to show the green light still lights even though the switch is different. Next the spectator chooses a switch for the yellow cover (no force) and behold when turned on it lights the yellow light. Finally, the red cover is put on the final switch which now turns on the red light. Amazing! The switches are turned off and the colored covers left in place. Now the colored light covers are removed to show all three lights are the same white color and only the lens covers are colored. The spectator is asked to select a color lens and choose a light to cover with it. This is done until all lens covers are replaced. Now, each switch is turned on to show the color switch still operates the colored light regardless of the fact the lens covers have moved. Amazing! Everything is turned off. The device is placed face down covering the lights. The spectator is asked to just think of a color lens (green, yellow, or red). The spectator reveals the color and the device is turned face up to show the chosen color light is now lit, despite the fact none of the switches were turned on. The device apparently “knows” the spectator’s choice and lit it up on its own. Amazing!" The ad copy and video demo above are both an accurate portrayal of this latest incarnation of the switchboard concept. The history of this thing goes back into the mid 1950's and perhaps further. I remember building something similar in my electronics class back in high school. It was a class project and as I recall my teacher was not a magician. But I digress. Some versions in the magic world have three bulbs while still others make use of four. Regardless, the general idea is pretty much the same. Colored switches cause bulbs of the same color to light whether the bulbs themselves are moved around or in some cases if the labeled switches are changed. In all cases this effect is just plain fun to do and spectators are always baffled. In a world full of smartphones and tablets you would think this trick would most likely bomb but I'm here to tell you that's just not the case. My guess is that the moving of the bulbs or switches and having the electronics still function correctly just doesn't make sense to the average person. Add to that, how many laypeople really know much about electronic circuitry? I suspect not very many and that's good enough for me. Besides, I think this thing looks so basic that the idea of special software or circuits just doesn't occur to people and especially when they are having fun. The Cobra Light really is a thing of beauty allowing a number of magical effects to take place while employing methods I haven't seen used in other similar devices. One additional feature makes use of a special receiver known only to the performer and I think this optional addition is something one should seriously consider. The Cobra Light is small and thus it can easily be carried with you in your pocket. This thing is all about showmanship and presentation. Depending on your performing persona this could really be funny or perhaps serious or even spooky. How you present this is of course a personal choice. My magic tends to have a lot of comedy so that's the road I take my audience down. So what are you getting for your hard-earned magical dollar? You receive the Cobra Light unit with one battery installed. My unit also came with an extra battery which I thought was thoughtful. Inside the package is a card giving you a web address which provides you with both an explanation video and a performance video. The teaching video explains everything you need to know in order to do the various effects and I recommend you give this several viewings so as to get the handling down. This trick is very easy to do but you obviously don't want to make any mistakes during a live performance so its best to get yourself comfortable with the operating procedure so you can then concentrate all your efforts on the performance part. The unit appears to be built to last and is quite easy to use. The unit does exactly what its suppose to do and the teaching video insures you'll be doing this in no time. I was comfortable with the handling in about half an hour and then spent about a week working on a good routine. The bottom line is that I like this and can see me doing this in the real world and I think you will too. Recommended. To order visit Cobra Magic Technologies' website by Clicking Here!